I don’t need to tell you how the French do things in just as much style when it comes to baby nurseries. I just need to take you inside this little French boutique. French label Lab Boutique is the epitome of Parisian chic. Lab manager Elodie Laléous started her line of designs as a natural extension of her furniture creations. Laléous went on to design sofa seat covers, duvets, cushions and blankets. But it’s her children’s designs that has caught our eye. 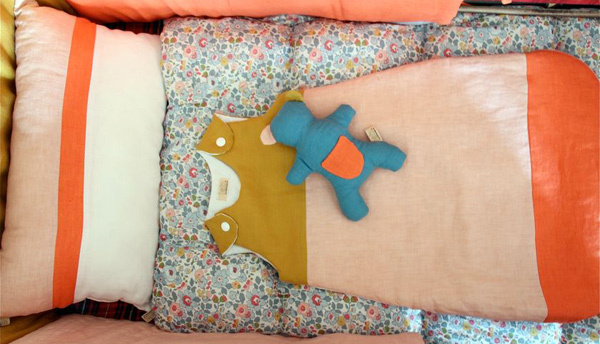 The sleeping bags come in a range of unique and stunning fabrics. With its black background and busy, colourful print, the Liberty Rachel design is a stand-out. Made of cotton with polyester padding and invisible side zip, it’s guaranteed to keep your bubba warm and on trend. Costs $108. Lab also produces terrifically cute mini animal cushions for $42. 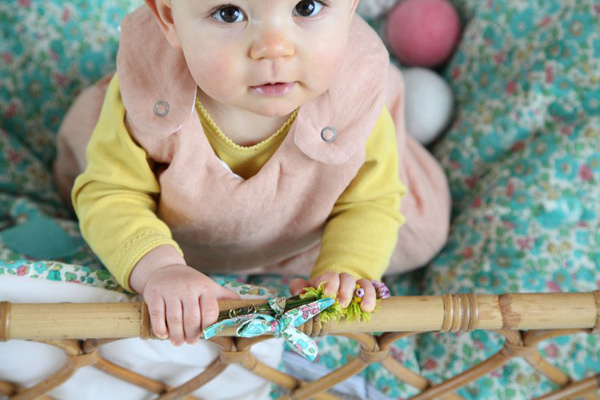 Lab creations are durable and made to withstand the most rigorous slobbering and baby maulings, ant the polyester fibre filling is hypoallergenic. Lab Boutique takes custom orders, so be sure to check out the bedroom and living room range to see if there’s anything else that takes your fancy. It’s difficult to choose a favourite fabric from Lab, but at a pinch I’d say mine is the brilliant green and aqua hues of the Green Betsy. 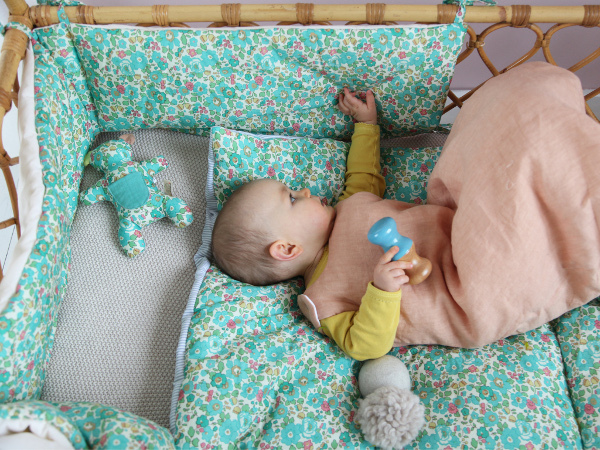 Like other Lab fabrics, the Green Betsy is used in a duvet cover, pillow case and cot bumper. Please note, although Lab produces a range of cot bumpers, these are not recommended by SIDS and Kids Australia and Babyology does not endorse them.